Quyên Ngô: Hi Andrea, thanks so much for joining us today to talk about bánh mì! Andrea Nguyễn: It’s my pleasure, it’s one of my favourite foods! Quyên Ngô: Well, since it’s one your favourite foods -- could you first break down the components of the bánh mì? What is bánh mì made of? Andrea Nguyễn: Sure! 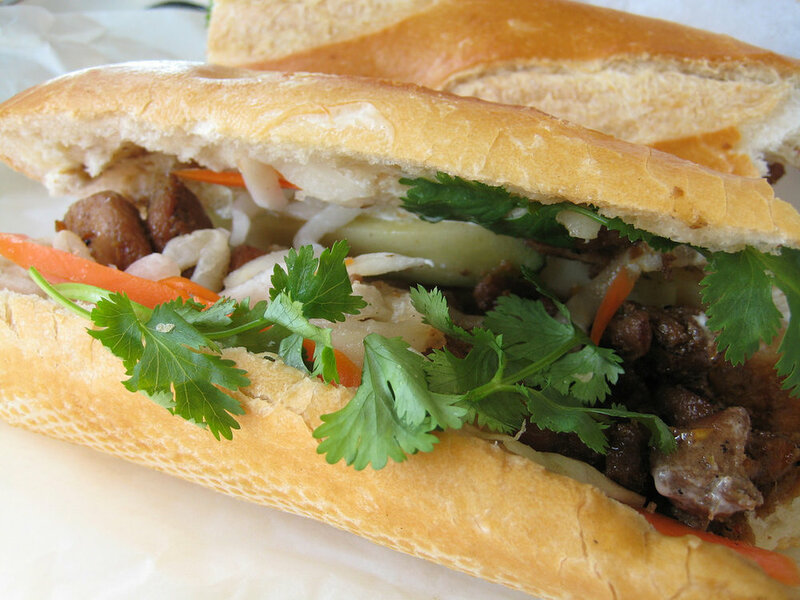 We know bánh mì to mean bread in Vietnamese. But it also has, over time, become synonymous with a Vietnamese sandwich. What’s in the sandwich? You’ve got the bread on the outside and it’s a very light, crispy baguette style bread. It’s not like true French baguette, but it’s a baguette style bread, and it’s a very light; a framework for what goes inside. There are many kinds of different bánh mì, but what most people think of bánh mì as the definitive one, is a Saigon style bánh mì. So what comes with Saigon style? So we’re talking about a really crazy collision of colors, textures and flavors. You’ve got mayonnaise, and sometimes butter lining the inside of the bread. Then you’ve got different kinds of meat. And I like to layer my bánh mì from the bottom to the top. So after yo have your bread and you kinda hollow some of it out, you’ll smear some fat on it! So you’ve got your mayo in there and then I like to put a bit of Maggi (Mar-zjhee) seasoning sauce, or some people call it Mag-gie, but I call it Mar-zjhee because I’m old, I was born in 1969 in Saigon and it’s a French pronunciation! So you drizzle that in there and then you’ve got your meats: it could be pâté, char siu, chả lụa; the Vietnamese silky sausage. You can also have some garlicky pork in there, all thinly sliced. There’s very little meat in this thing! Then you’ve got the daikon and carrot pickle. And it can’t just be carrot, there’s so many cooks that just rely on carrot and carrot pickle is wimpy! You’ve got to have some funk from the daikon. Chili slices, cucumber for crunch, cilantro for pungency and that herby finish. Close the whole thing and take a bite. Quyên Ngô: You mentioned Maggi, which, as I know, is a Swedish-German brand of seasoning sauce. Is that something that has always been a part of the bánh mì? Andrea Nguyễn: Yes it had been. Well, no I take that back. And the reason being is that when I was growing up, my parents are both from the northern part of Vietnam. So the bánh mì that they grew up with was just the bread, a little butter if they could afford it, if they could really afford it; a smearing of pate, and then salt and pepper. And so there was no Maggi in there. The Maggi is really something that when you think about, the cost of a French imported product in Vietnam, was really deluxe. It was like high-class living if you could have Maggi on your table at home. So with the Saigon style bánh mì, which my understanding is that it came about during the 1940’s, and that’s according to friends of my father who are all in their eighties now and they’re like "I remember when that came around in Saigon in the 1940's! There was this one street vendor who started putting all these meats in there!" Because it’s murky as to how all these different types of bánh mì evolved. So then you had the Maggi coming into play. Some people don’t put it in there but you know, there is something that is so magical that happens when the Maggi hits the mayonnaise and then it combines with all the other elements, and especially with the cucumber and the cilantro. And I layer my things up in a way so that when you bite into it, there’s a really synergistic effect in terms of how the textures and flavors hit. And the Maggi is originally made out of wheat, it came about in the 1880’s, now Nestle owns it, and there are so many different variations and versions of Maggi all over the world developed for specific cuisines and ethnic groups. Quyên Ngô: So many versions, just like bánh mì itself, which is sort of an international phenomenon. Is that a part of why you decided to write a bánh mì handbook? I mean, there are so many vietnamese dishes… why bánh mì? Andrea Nguyễn: Well, I think you can tell the story of Vietnam through this little sandwich. Over the course of the years, I’ve been writing about vietnamese food, since probably around 2002 when I first started my website Viet World Kitchen. Over the years people have often come up to me and said "Oh, isn't Vietnamese food heavily inlfuenced by the French?". And to a certain extent, yes. But the French were technically in Vietnam as the colonial power for (only) 75 years. Vietnam has a very long history and is geographically influenced by so many other cultures: the Chinese, the Khmer, the Indians, and then all of the people who landed in Vietnam through the very long coastline. And so to say that Vietnamese food is defined by French food? I’m sorry, that’s wrong. Vietnamese people, culturally, have always had to deal with foreign incursion. As a survival tactic, what people have done is they absorb the best aspect of that culture under the situations that they’ve had to live with, under imperialism or colonialism, and then they make it their own. So with bánh mì, the thing that’s so fascinating is that the bread, in the early part of the twentieth century up to the 1940’s, it was called “bánh mì tây” (western bread). And then the bread became such a part of regular normal Vietnamese life, that people dropped the word “tây” and they just call it “bánh mì”. And then people started putting things into it, filling it not with just pate, but with all the ingredients I mentioned earlier to create a sandwich. So then it became “bánh mì ổ”, a sandwich and a roll, and then now it’s just “bánh mì”. In bánh mì, you have all these elements that are from the east, from the west and sometimes from America if you count something like spam. Or like canned ham, or even the rooster branded Sriracha sauce. And in the Banh Mi Handbook I have a variety of different pickles, I make bánh mì sliders, I make bánh mì buns, and variations of bánh mì that are modern along with traditional ones. I think that it tells the evolution and story of Vietnamese food very well because over time there have been things that are fundamentally Vietnamese and elements that are Vietnamese, and you have to stay true to that. Then you can pull elements from (what) you come in contact with and you can add to that foundation to create something that is still uniquely Vietnamese. "Aha! I'm going to put some chilis in there for heat. And then cucumber! And then I'm going to throw some cilantro in there. And hey, we're got these beautiful local black peppercorns, let's add some heat! And then we're going to make sausages and wrap them in banana leaves and mis them with that pate." And that is Vietnamese. That is not French. And I don’t think the French can take that from the Vietnamese. Quyên Ngô: So you wouldn’t label bánh mì that french. Andrea Nguyễn: This is not a French thing. But to say "Oh, it's so Indochine", you know, it’s just a part of Vietnam’s very long history. I think that long history needs to be recognised because Vietnam has always struggled to have self-determination. You see that in this little sandwich! It’s like: "Okay Vietnamese people, now you have to try to bake baguettes in your tropical humidity." And if anybody that’s ever baked bread and tried to do it in humid conditions, it’s so difficult. And somehow Vietnamese people managed to do it, do it quickly, make a lot of them and popularize it. That is quite an amazing feat. I feel that to define Vietnamese food, Vietnamese cuisine, as one being heavily influenced by the French, that negates about 85 percent of what makes Vietnamese cuisine Vietnamese. Quyên Ngô: Right right. Again, thank you so much Andrea Nguyễn for going “On The Record” with us at Loa today. Andrea Nguyễn: Oh, it was my pleasure. Thank you.